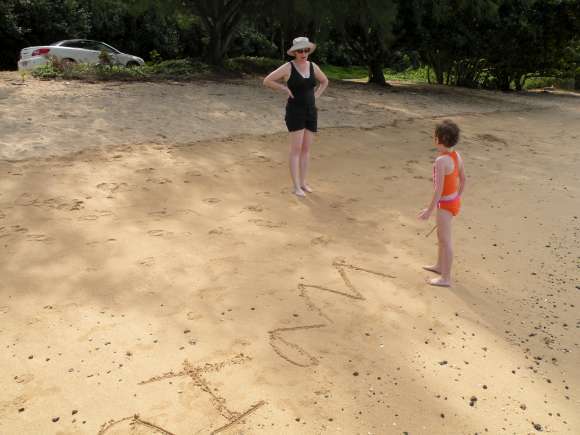 Since we were visiting Kauai to celebrate our 10th wedding anniversary, we wanted to do something special. We had seen most of the island on our previous visit (it’s not a big island), but one of the things we had not done was take a helicopter tour of the island. In fact, we had never even been inside a helicopter before. But we had heard that a helicopter tour of Kauai was a very impressive way to see the Na Pali coast. With Sydney hopping around on one foot because of the bee sting she received the day before, we were limited in the activities we could do. The weather was good so we decided that today was the day we would take our helicopter tour. We looked in our guidebook as to which company to choose from, and went with the recommended Blue Hawaiian. One phone call later and we had reservations for that afternoon. Upon checking into the Blue Hawaiian office we had our safety briefing (don’t touch any buttons!) and were given inflatable life jackets just in case of a water landing. When was the last time you heard of anyone surviving a helicopter landing in water? But, with our reassuring life jackets and safety knowledge we loaded into a hot van and headed to the helicopter pads at the Lihue airport. As we waited for our helicopter to arrive we watched as other helicopters took off and landed. It really reminded me of that helicopter scene in Apocalypse Now, “Charlie don’t surf!” Once our helicopter arrived we loaded into it and were buckled in and handed headphones and a microphone to allow us to communicate with the pilot. We also located our barf bags, just in case. The three of us had all four of the available backseats in the helicopter, which was pretty cool. Having never been in a helicopter before, I was not sure what to expect. But after taking off… wow! If I was to win the lottery, a helicopter would be high on the list of things to buy. It is hard to describe the amazing scenery of Kauai from the air, so I will let the photos and video do that. And even those do not come close to showing the amazing beauty of Kauai. Our one hour flight was amazing and worth the money we spent. And the funniest thing happened during our flight. Sydney fell asleep. After spending the day flying to the Hawaiian island of Kauai from the mainland we made our way to Costco and Safeway to buy groceries for our stay. While the food is really expensive in Hawaii, Costco’s prices are generally the same prices as they are on the mainland. We filled every nook and cranny of our rental car with luggage and groceries and then made our way to the north shore of the island where we would be staying 7 peaceful days, or so we hoped. We checked into our accommodation in Princeville and unloaded our luggage and groceries and called it a night. Around 2am we were awakened by a most annoying sound; a rooster crowing right outside our window. Kauai is infamous for its annoying roosters, but on our previous visit, we had never actually been woken up by them. The rooster’s crowing continued until 6am when our daughter Sydney started crowing that she wanted to get up. So, we were all up. After breakfast we packed a lunch and grabbed our snorkel gear and headed down the road to ‘Anini Beach, a kid friendly beach with good snorkeling and not too many people. After spending some time snorkeling and not seeing much we returned to the beach and decided it was time for school. To take this trip we pulled Sydney out of school. We feel travel can be as educating as any classroom, but the basics still need to be taught. Being a master in geography is always useful, but not knowing how to read or do math is just not going to cut it. So, before leaving we spoke to her kindergarten teacher about what she was working on and what they would be working on while she was gone. This was going to be our first experience homeschooling Sydney and something that will be more common once we start our round the world trip. We have always read to her and had been purchasing educational workbooks the last few years to jump start her education, but now we had specific requirements to be met; and already we failed. In our haste, we forgot to bring paper. But who needs paper when we have a sandy beach and a stick. 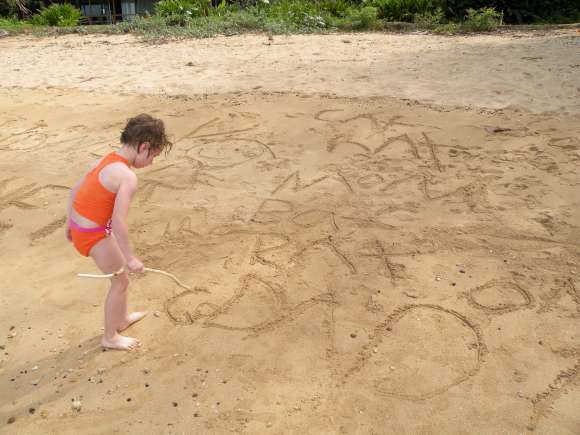 So, she did her writing assignments in the sand with a stick, and it worked out well. And it was much more fun than sitting in a classroom with paper and a pencil. After her writing assignment was done we started on sandcastle engineering, a very important subject. But during the process of building, Sydney found the one and only bee on the beach and stepped on it with her bare foot experiencing her first bee sting. Surprisingly, she did not cry and only complained that her foot REALLY hurt. Kerri pulled the stinger out and we scratched our heads as to how to stop the pain. We had nothing with us, other than ice. So we applied the ice, packed up all of our stuff, and drove to the nearest market and bought some bee sting relief and paper. So now, Sydney has finished the rest of her school work and is hopping around on one foot complaining that her swollen foot still REALLY hurts. We are planning on doing a hike to a secluded beach in a couple of days, so hopefully her foot is feeling better. We are flying out Sunday morning to spend a week in Kauai for our 10th wedding anniversary, with our wonderful 6-year-old daughter of course. As the weather turns cooler here in the Pacific Northwest, we find tropical getaways like this most beneficial in helping us get through the dark and rainy fall, winter, and spring… basically the 10 months of the year that do not have sun and warmth. We are really looking forward to this trip, but I have my usual pre-travel phobias. Not the typical travel phobias of flying in an airplane, crossing oceans, or getting kidnapped and beheaded by some extremist group, but something much worse. The week before flying to “someplace amazing” I become worried that I will get hurt or sick and won’t be able to go. There would be nothing worse than missing a trip somewhere warm and tropical! The weather has actually been nice this week and I will usually ride my motorcycle to work with these conditions, but not this week. There is no way I would risk breaking a leg or worse and missing a trip to Hawaii. So, this week I have been extra careful in eliminating any risk that could compromise this trip. This phobia even extends to the security-screening checkpoint at the airport. I always double check my backpack to make sure I did not leave a pair of nail clippers or something that would get me barred from boarding the plane. On the way home, who cares! But on the way there, everything must be perfect. So, wish us luck that nothing will happen between now and boarding our plane Sunday morning and I will promise to post lots of photos of a tropic island paradise.